Remember a few months ago when horrible tooth extractions had to happen? Well, here we are again, at Part Deux, in which the Oral Surgeon implants dead guy bone both under the sinuses and under the gums to create a Sturdy Anchoring Spot for a titanium post which will eventually have a Fake Tooth built onto it. Sounds like fun, right? No, I didn’t think so either. I was picturing some sort of peeling back of the face in order to shove dead guy bone in, but apparently it’s much less invasive than that, even though it calls for a general anesthetic. And dead guy bone?! Wow. Just….wow. So, yesterday, I was Madame Chauffeur to my Beloved, and I sat in the waiting room reading Wicked for an hour and a half. The Rules we were given included having him eat cold, soft foods. She even said, and I quote, “ice cream, pudding, Jell-o, etc.” This is the only Good Part of the whole process: the eating of not-so-healthy foods with the doctor’s blessing. Thank you, Dr. Won, for letting us snack on junky food for a few days. Oh, did you catch that “us?” Yeah, well, I didn’t want him to feel Singled Out, so I have embarked on this journey with him because I am Selfless. Other snacks on our personal list include pimento cheese, beloved cracker spread of The South, and hummus. No, The Beloved will not be enjoying the cracker portion of the show, but my Wheat Thins are ready to go. This is one of those southern treats that can be made a ton of different ways, so don’t stress over it. You can make this in a food processor or by hand–it all depends on how homogenized you want your final mixture to be. If making by hand, grate the cheese and mix together with other ingredients. to taste. Stop when you like it. To make in a food processor, pulse to desired smoothness, but add the pimentos last so they don’t get too blended up. It’s fun to see some red flecks in the Final Product. use as veggie dip with carrots, celery, etc. Dear US readers, I hope you have a Fantastic Fourth. Dear International Readers, I hope you have a fantastic weekend. And to everyone, make some pimento cheese, it’ll make you feel good! And The Beloved’s new name? Sir Costsalot. A Very Lot. 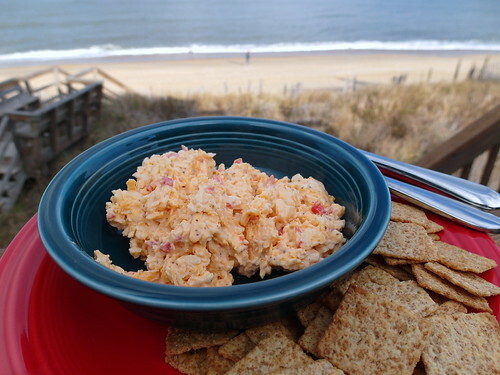 I have to admit I was a little skeptical when I saw pimento cheese mentioned in your “Tweet”, but that looks delicious! I think I’ll be making that one soon. From now on – whenever I’m having some of my wife’s unbelievable pimento cheese spread (right along up there side-by-side with your fabulous recipe, Jenni) – I’ll be waiting to crack my partial on a sneakily hidden piece of “dead guy bone”. 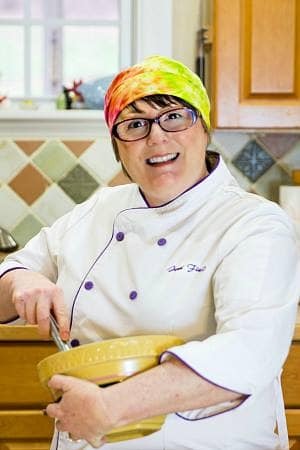 Thank you very much, Chef Jenni, you! Dead guy bone? I had dead cow bone myself. All crunched up like sand, and bits kept falling out through the stitches and getting mixed up in my soft food making it gritty. All worth it in the end though. And the cheese does look yummy.